Getting to The Spinnaker is easy and convenient. The following are clear directions based on your method of transportation, whether it’s by car, ferry, bicycle, or bus. From San Francisco: Take Highway 101 north across the Golden Gate Bridge, exit at the first Sausalito exit (Alexander Avenue) and take the winding road down the hill to Bridgeway. Bridgeway follows the shoreline around and enters Sausalito, continue to the center of town, there will be a small park with an ornamental fountain, take the right hand turn at the north end of the park (Anchor Dr.). Follow Anchor Drive out to the Spinnaker. 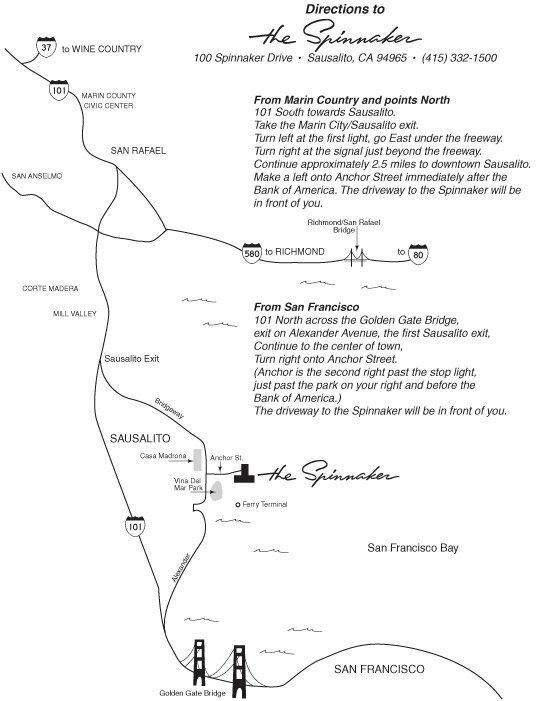 From Marin County and Points North: From Highway 101 south toward Sausalito, take the Marin City/Sausalito exit. Turn left at the first light and go east under the freeway. Turn right at the signal just beyond the freeway and continue approximately 2.5 miles to downtown Sausalito. Make a left onto Anchor Drive immediately after the Bank of America. Follow Anchor Drive out to the Spinnaker.